Yep, my IBM PS/1 model 2133 386 SX 25 uses 72pin FPM modules along with the 2MB on the motherboard itself. You guys with all your weird hardware combinations. I hope nobody come's forth with 30-pin EDO SIMMs. That'll be the day eh? I really have appreciated all the help, it's been a great learning experience! How about EISA? 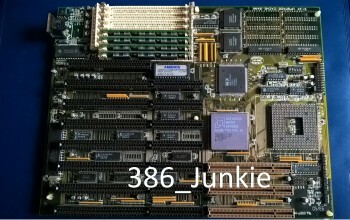 It's kind of the PCI-X of the 386/486 era, correct? Mostly server usage? 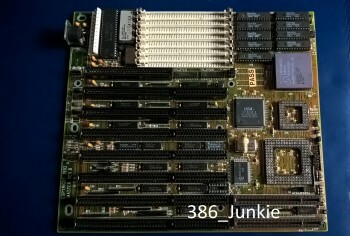 EISA for 386s exists, but it's mostly an OEM thing (nonstandard motherboards that only fit in the manufacturer's chassis). These boards tend to be a bit dated, but could still be fun to play with. Compaq, ALR or AST probably made the better ones, but AST had weird 64-pin memory. 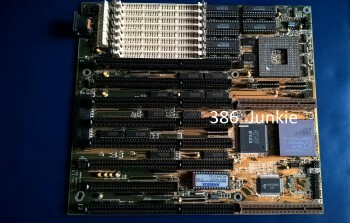 There are a few AT formfactor EISA 386 boards out there, but you can count them on one hand. I've never seen one in person or for sale online. Is EISA worth it to look for in a 386 system? Jupiter-18 wrote: Is EISA worth it to look for in a 386 system? It would be worth your while to investigate the technology and have a better understanding of it first. As with everything, there are limitations. To be "worth it", it largely depends on what you hope to achieve. It might be worth it for a hard disk controller or a network card. 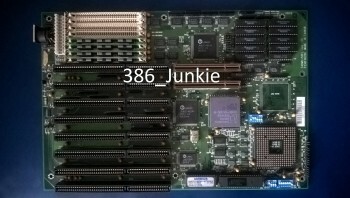 I highly doubt that the 386 can take advantage of the extra bandwidth of the EISA bus, but if you have a lot of RAM installed, it might be advantageous to have your adapters on a bus that has more than 24-bit address lines. I've never used a 386 with EISA bus, but it's something on my list of things to try. I'll put that lower on my list. EISA for 486 would be fairly high-end and a rarity today. The motherboard and EISA cards might be costly and difficult to source. If you aren't familiar with EISA, then you'll need to do some learning - they use different configuration files for each EISA card, which I think gets loaded into the NVRAM of the RTC module. I've never used an EISA system. Too fancy for me, but if I had one, I'd use it. VLB for 486 was very common and is a very popular setup. The motherboard shouldn't be too difficult to source unless you want a PS/2 mouse header. High-end VLB graphics and SCSI controllers are getting expensive and more difficult to acquire. Your thread has got quite subjective... it seems to go in different directions every time I go and comeback... and being 386 related, I like it! I will be picking this back up when I get the chance... once the ship has steadied and I sort a new hard drive from the stack. There is lots of information and resource to look through/at. It is a fun ride... personally I would recommend you do both a 386 VLB and 386 EISA system, testing them both for yourself and for Vogons, by publishing the results of each online... possibly even comparing them. No better way to learn and support Vogons. They should be classified as 486 boards though. 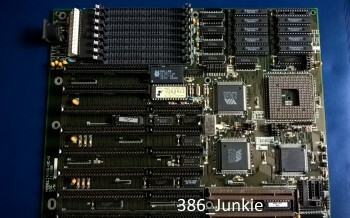 Those all look like motherboards with a 386/486 hybrid chipset. 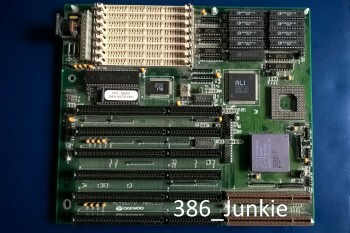 Even the board with the ALi M1429 is a hybrid chipset, although it does not contain a socket for a 486. I recall seeing this chipset with a 486 socket as well. To me, the ALi M1429 looks the most interesting because it lacks the 486 socket and can pretend to be a true 386. It would be nice to see some benchmarks taken with the ALi M1429 with DX-40, DLC-40, SXL-40, SXL2-50, SXL2-66, SXL2-80, DRx2-50, DRx2-66, BL3-50/66/75/80/100/110, RapidCAD, and Transcomputer. Basically, all these, viewtopic.php?f=46&t=53096 . From what I recall from another poster, a 386 board with VLB only seems to show any benefit from VLB when using clock doubled CPUs. 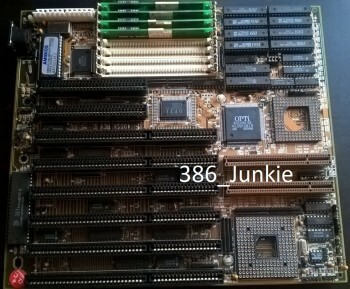 I'll be working on a mega 386 benchmark thread in the far future, run on 386-native motherboards. It might be of value if I can cross-reference such a benchmark thread to a 386 board with a VLB slot to see what percent improvement there is with the VLB based on various CPU speeds. I recall running a Cyrix 5x86-133/4x with an ISA ET4000AX and a PCI Trio64 in DOS Quake. If I recall right, the Trio64 scored around 17.7 fps, while the ET4000AX scored around 14 fps. I thought the gap would be larger, but I guess this game is really held cripple by the CPU for this configuration. I wouldn't be too surprised if the ISA vs. VLB for 386 had a similar performance ratio. feipoa wrote: From what I recall from another poster, a 386 board with VLB only seems to show any benefit from VLB when using clock doubled CPUs. In my opinion, it has more to do with whether or not the CPU has any cache. When I compared a VLB mach64 with an ISA mach64 on an OPTI495SX motherboard, the i386-33 (overclocked to 40) only showed a small performance increase using the VLB card. However, the TI486SXL-40 and BL3-66/100 both benefited greatly from VLB. The SXL-40 was not clock doubled, so I can only assume it must have been the cache that made the difference. Too bad I didn't have a 1kb DLC chip to compare. In my opinion, it has more to do with whether or not the CPU has any cache. You are both right regards to clock-doubling and cache ... though the performance of the above boards was much more sensitive to the presence of cache than an increment of FSB. RAM with a lower latency also played a part, and is why I set about fabbing some 40ns SIMMs. Starts somewhere around here: viewtopic.php?p=468628#p468628 on page 8 and reaches an apex around page 10. The user with the results is skv400. You did comment shortly thereafter in this thread. Probably too long to skim. Last edited by feipoa on 2018-2-06 @ 00:24, edited 1 time in total. Any particular tips for that? Pure 386, no hybrid chipsets, isa only? My preference is a pure 386. If you want a VLB, I like to use a more powerful VLB 486 motherboard from ASUS with PS/2 mouse support. If you want EISA, I think EISA 486 is more conventional. But if you want to go all out, the go pure 386, hybrid 386 w/VLB, 5x86 VLB, 386 EISA, 486 EISA. 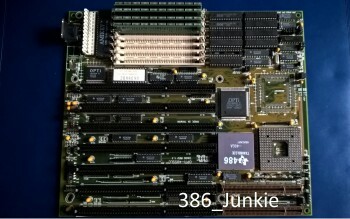 If you were just building one system and like 386's, my preference is pure 386 motherboard with a faster PGA132 upgrade CPU. I'm actually looking at ways of having a slower 386 CPU. 386_junkie wrote: All are 386, and all are VLB. I have tested each to varying degrees, though the project is still very much work in progress. Nice collection - I have two myself (one unfortunately not working and I'm still trying to fix that one). I noticed the one motherboard you have has an OPTI 495SLC chipset - I have the exact same motherboard (I believe it's actually a DataExpert EXP3406) but, mine has an OPTI495XLC chipset. Have you also found with this motherboard, in protected mode (i.e., with EMM386.EXE loaded), that the turbo function does not work?